Today's card is another simple card using the Picture Perfect Birthday DSP. This one is so easy to make. 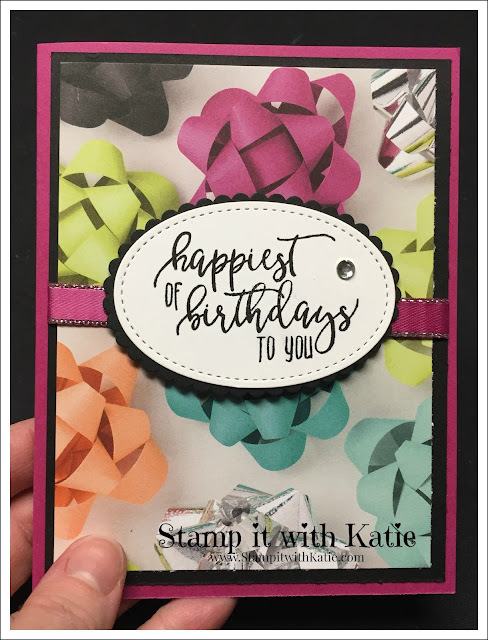 Berry Burst cardstock 8 1/2" x 5 1/2" , score at 4 1/4"
Add a layer of Basic Black 5 1/4" x 4"
Add a layer of bows from the Picture Perfect Birthday DSP 5" x 3 3/4"
Cut out a Whisper White Stitched oval and stamp the sentiment in the center. 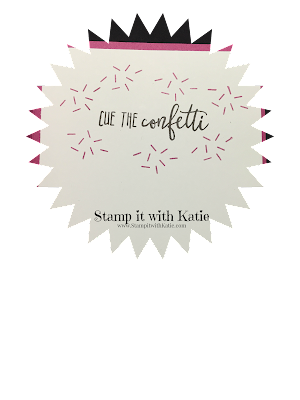 For the inside I added a piece of Whisper White cardstock 5 1/4" x 4" and then stamped "cue the confetti" in Archival black ink and confetti in Berry Burst ink.